The boutique affair, which labelled itself as more of an ‘immersive experience’ than a festival, saw internationally acclaimed yoga teachers and 500 lucky attendees gathered in a luscious green area of rural England surrounded by lakes and woodland. Daily workshops were held in a circle of tipis surrounding a central stage for music. A Liz Earle spa with free treatments was on and there was a VIP area with cloud-like beanbags, supperclubs, and complimentary gin cocktail hours. 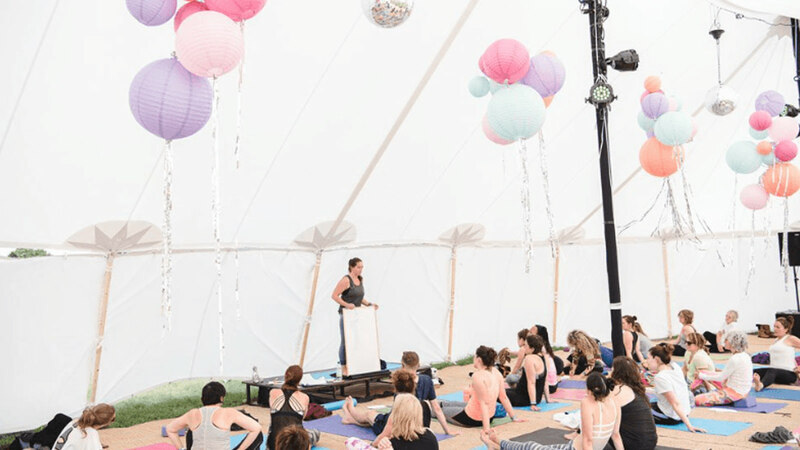 For those who know about these kinds of things, there were some serious big names in the world of yoga teachers, including the festival’s organiser and Broga teacher, Matt Miller, who brought along his adorable tshirt-wearing sharpei dog, Professor Wrinkles. It would have been easy for a festival focused on wellbeing to neglect the entertainment but kudos had to go to music organiser, Josh Dean. An impressive musical line up of small bands, poets and DJs envoked a feel-good festival vibe that saw people dancing – and of course doing musical yoga – until the early hours. Dean presented the Fat Hat Collective, a group of bands from South West England, whose unique blend of live hip hop, ska, drum’n’bass and soulful singing causes some truly original sounds. Friday night had a selection of lively bands including the awesome Regime. Saturday’s musical highlight had to be the phenomenal Inexplicables, a six piece party band from Bristol and Sunday’s Ushti Baba got everyone moving, despite the rain. Some felt Soul Circus was an event only for those who are REALLY into their downward dogs, those who only have a passing interest might find themselves craving a more varied programme with other exercise and wellbeing activities. The festival brought happiness to everyone who attended, not many events can say that. It was a truly unique, beautiful celebration of life, love and wellbeing. Roll on 2017!